The Washington, D.C. region's Transportation Planning Board today approved a $10M grant request for a regional bike-sharing program as part of a package of transit projects to improve mobility in the region. The multi-modal, multi-jurisdictional package includes bus rapid transit better connecting the suburbs to the central business district using Federal stimulus funds through the American Recovery and Reinvestment Act's (ARRA) TIGER (Transportation Improvements Generating Economic Recovery) program. Should the Federal Transit Administration approve the grant, the urban core of the Washington, D.C region, which also includes Arlington and Alexandria, Virginia; and Bethesda and Silver Spring, Maryland would receive funding for about 1,600 bikes and 160 stations. Jurisdictions outside of the urban core also requested to be part of this grant application. A regional bike-sharing program would provide Washingtonians another fast, green, and healthy way to get around town, while encouraging additional bus, subway, and train trips. Along with providing a new transit network in its own right, bike-sharing also extends the reach of these complementary transit modes by offering an easy way to reach these stations with a relatively low-cost "first mile/last mile" solution. According to The Examiner, "Chris Zimmerman, who is a voting member on the board [from Arlington County], said he thinks the bike system will help make local public transportation complementary. 'It's the synergy among those things that are so important,' Zimmerman said. 'It encourages people to adapt to lifestyles other than getting in a car and driving somewhere.' 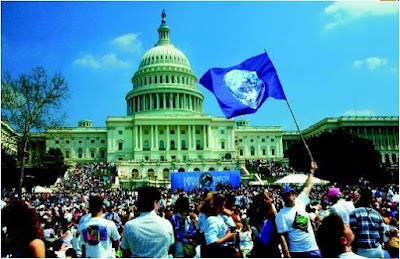 "
As Washington, D.C. was the first to have a 3rd generation bike-sharing program in North America and Arlington, Virginia is rushing to be the third (after Montreal), the Washington region hopes to create a model for other North American regions wanting to implement multi-jurisdictional bike-sharing programs of their own. Washington, D.C.-based MetroBike, LLC (the provider of The Bike-sharing Blog) is proud to assist Arlington and the region in progressing towards a full-scale regional bike-sharing service. In Paris today, the second anniversary of bike-sharing with Vélib' was celebrated. On 15 July 2007, the system started with 1000 bikes in 750 stations and kept its promise of having 20,000 bikes in 1,450 stations by the end of the year. It greets its second anniversary with 24,000 bikes and 1800 stations serving Paris and its immediate suburbs. With 54,000,000 usages in two years, Vélib’ is the gold standard in Public Use Bicycles. On average, during the last two years, every day 9500 single or seven day subscriptions were sold from the stations on the street. 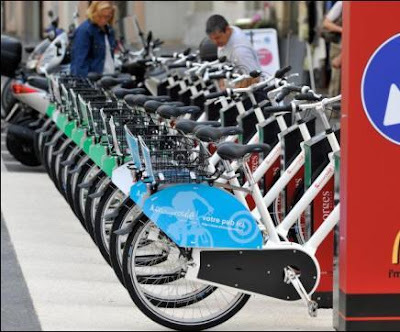 "In response to numerous requests from Montréal boroughs and residents, Stationnement de Montréal has been authorized by the city’s executive committee to launch phase II of BIXI this summer. "This second phase will involve adding 2,000 BIXI bikes and 100 new stations in the boroughs of Mercier/Hochelaga‐Maisonneuve, Côte‐des‐Neiges/Notre‐Dame‐de‐Grâce, Villeray/Saint‐Michel Parc‐Extension, and Le Sud‐Ouest. More stations will also be added in Outremont and Rosemont‐ La Petite‐Patrie to complete the deployment in those boroughs. 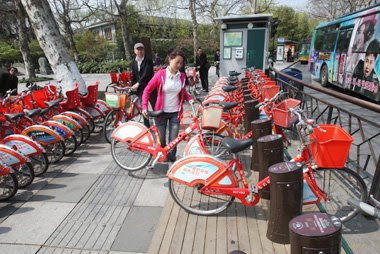 In all, the service will count 5,000 bikes distributed among 400 stations. "With this second phase, the project budget increases from $15 million to $23 million. "When the project was launched this spring, Montrealers immediately took ownership of the service. In just seven weeks, they have made more than 220,000 individual trips covering over a million kilometres. “Adding more bikes and stations will allow us to serve a larger percentage of the public and to be present in more high‐traffic areas, such as near educational institutions, public markets, and tourist attractions such as the Biodome,” declared Alain Ayotte, executive vice‐president of Stationnement de Montréal. Update: Good news: In the almost two months of service, the over 225,000 BIXI trips were taken by almost 47,000 users of which over 6,300 are long term subscribers. 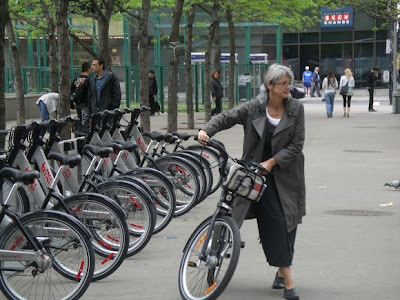 Not so good news: At a recent inspection of 10% of BIXI stations by reporters of La Presse, they found 1 in 5 bikes in disrepair and some docking racks vandalized and unusable. Stationnement de Montréal says that it has technicians out daily. With world renowned precision, the Swiss are beginning bike-sharing in the cities along Lake Geneva. The first part of the system opened last week in Lausanne, Lausanne Roule, and will have 165 bikes in 14 stations in three municipalities by July 15th and 370 bikes by the fall. At Vevey for those who have a sweet tooth, there are bike stations at the International Headquarters of the chocolate giant Nestlé. Switzerland is a confederation of cantons or states; it appears that Swiss bike-sharing is being set up as a confederation of systems. The national subscription RFID (radio frequency identification) Card of Lausanne Roule can be used in the member cities of Suisse Roule: Geneva, Bern, Neuchâtel and Zurich. Not all these cities have 3rd generation systems yet, most are run manually. The news service, 24 Heures , reports that in the Lausanne program, the first 30 minutes of use is free, then each subsequent hour is CH₣ 1 (a little less than US$1.00). The regional daily subscription is CH₣ 5, the monthly is CH₣ 15 and the yearly is CH₣ 35. For national use, the yearly subscription is CH₣ 50. The bikes are specifically designed for Switzerland and carry advertising. Unlike most bike-sharing bikes, there is a basket in the rear rather than in the front. The docking stations are a similar system to the Italian Bicincitta. Suisse Roule is set up as a nonprofit agency. It has both government and private sponsorship. Three quarters of its revenue comes from the ad sales on the bikes and user fees.